Hi lovelies, thanks so much for your recommendations on this post re what to buy from French Pharmacies. I've bought a few things already, but since we're in France for another week or so, chances are I'll be buying some more so I'll do a post on my purchases when I get back home. In the meantime, here's a post I'd prepared earlier before I left home. I posted about the Dior Constellation Palette from the Mystic Metallics collection previously HERE. The colours are surprisingly wearable for my skintone so I have been using this quite a lot lately. 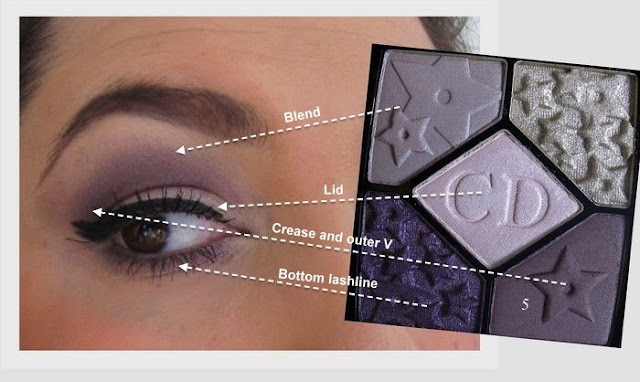 Sometimes purple eyeshadows can make me look tired but I find these shades are quite easy to wear. Maybe because there's a bit of warmth to these shades. My favourite way to wear the colours from this palette is to wear the lightest shade on the lid then cut the crease with the darker shades. Here's a quick picture showing where I've applied each colour for this look. Not pictured is the liquid eyeliner (Australis Curve Ink) and mascara (L'Oreal Voluminous) that I used. Do you wear purple eyeshadows or do you shy away from it in as it can be a difficult shade to wear? YeP, I love wearing purple eyeshadow because it is elegant, looks great in a smokey eye and can be either intense of soft. I caution though that you need to get the cool/warm combo for your skin tone correct because otherwise it will not be flattering! I've not tried purple before, preferring to stick to the earthy shades. But I'd love to give it a try. gorgeous palette, you look lovely! Purple is my favourite colour! Although I must admit that I don't wear purple shadows a lot. And if I do, I always wear light colours like lilac. Love the eye makeup, Lilit!